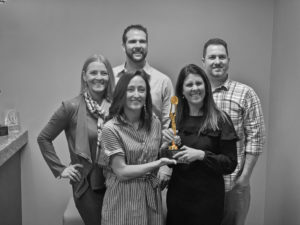 The Stacy Barry Team, led by Stacy Barry, CENTURY 21 Scheetz 96th location, won the CENTURY 21 highest award, Grand Centurion Team, for the 2018 sales year. The Stacy Barry Team consists of five top-producing real estate agents Kristen Yazel, Kimsley Farrar, Jake Basker, and Lee Skiles. The team also has two full-time staff members, Richelle Sassatelli and Jaimee Moran. In 2018, The Stacy Barry Team listed and sold 200 homes in the Indianapolis metro area. The team is the leading real estate team in sales in Hamilton County. The team not only ranks at the top of all of the CENTURY 21 Scheetz 9 offices, it is also ranked 17th nationally within the CENTURY 21 system. The Stacy Barry Team is ranked #2 in the Indiana and Ohio region. Barry believes that the team’s approach to constantly learning helps them outpace the competition. “We make learning a top priority so that we stay ahead of all real estate and marketing trends,” said Barry. The new year is starting out strong for the Stacy Barry Team. With already 26 homes listed this year, the team is projected to set another sales record in 2019. Information is provided exclusively for consumers' personal, non-commercial use, and may not be used for any purpose other than to identify prospective properties consumers may be interested in purchasing. Listing information is deemed reliable, but not guaranteed.